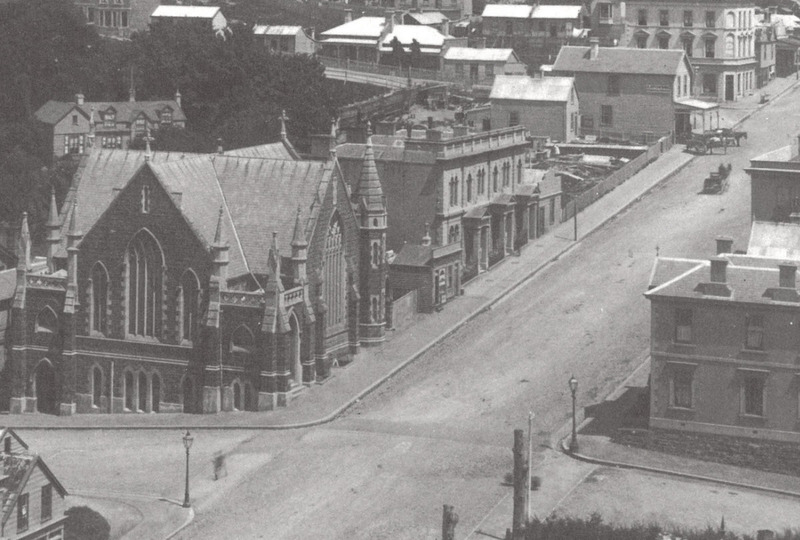 The buildings as they appeared c.1907. Ref: Collection of Toitu Otago Settlers Museum, Box 57 Number 200. Since the demolition of its northern neighbour in the 1980s, the facade of 100-108 Princes Street has come to a slightly raggedy end, and the off-centre word ‘Hotel’ has looked a bit peculiar without the word ‘Central’ that once followed it. Although the two buildings that formed the Hotel Central had an integrated facade, they were separated by a party wall and had distinct roof structures. They were even built under separate contracts for different clients. The surviving portion was built for the drapers Thomson, Strang & Co., and the demolished one for Dunning Bros. Built in 1873, the buildings replaced wooden structures that were only about ten years old, but which in a period of rapid development were already seen as the antiquated stuff of pioneer days. The architects were Mason & Wales and the contractors Wood & Steinau. 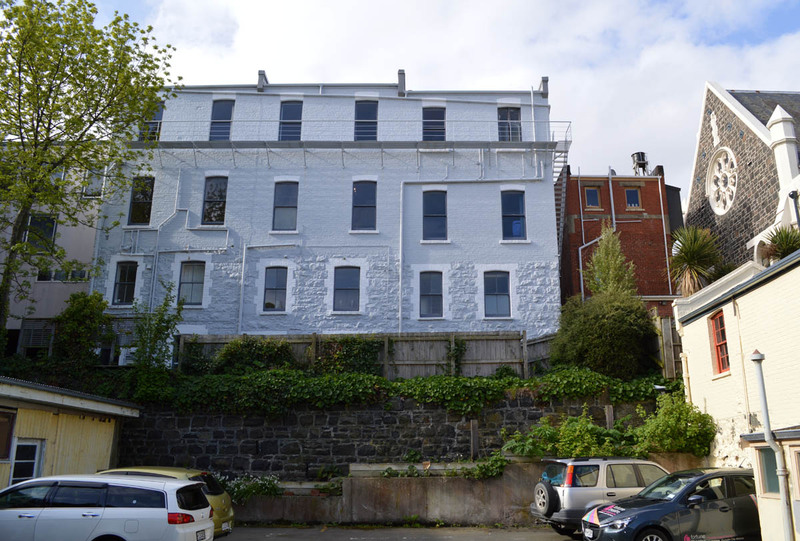 The buildings were described in the Otago Daily Times as ‘very handsome’ but it was remarked that ‘their elevation and length appear to be altogether out of harmony with the irregularity of the comparatively small structures opposite’. The facade originally featured a bracketed cornice and most of the first-floor windows were hooded. Stone was used for the foundations and ground floor, and brick for the upper floors. 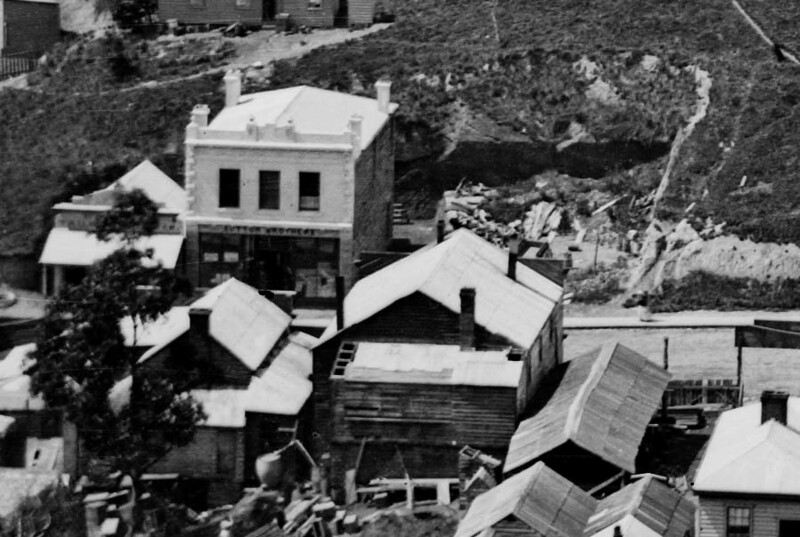 Detail from a Burton Bros panorama, showing the buildings as they appeared in 1874, not long after their completion. Ref: Te Papa C.025695. Who were the Dunning brothers? Alfred Theodore Dunning and Frederick Charles Edward Dunning were English settlers who started out as fruiterers in Princes Street in 1864. Frederick left the partnership in 1871, but did return for a few years later in the decade. In 1874 Alfred was granted a license for the City Dining Rooms, which he opened upstairs in the new building. 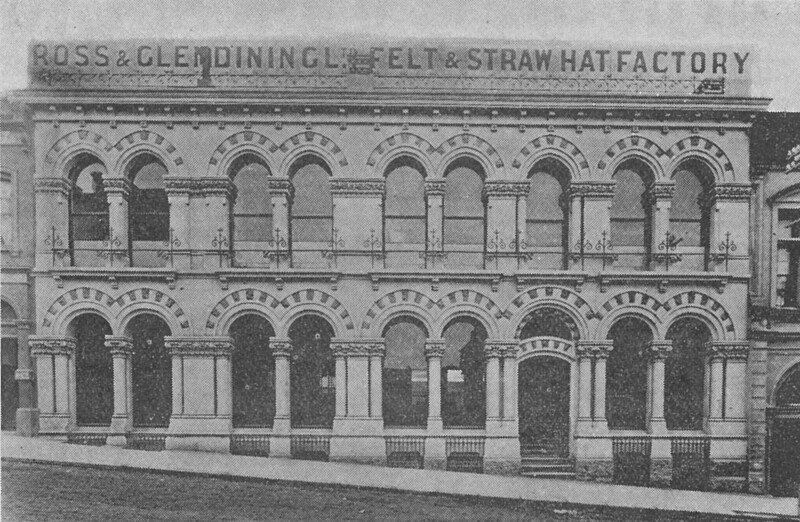 He established a hotel across the upper floors of both buildings, and from 1878 the establishment was known as Dunning’s Central Hotel and Café. The portion above the drapery contained bedrooms, while rooms in the northern part included a dining room, offices, and a large billiard room. Alfred was known for his joviality, uprightness in business, and warm-heartedness, but although he did well in the hotel business he was less successful when he left in 1881 to take up theatrical management. He lost most of his money in opera ventures and died in Melbourne in 1886 at the age of 41. Frederick became a fruiterer in Christchurch, where he died in 1904 after falling from his cart. The drapery firm Thomson, Strang & Co. had started out as Arkle & Thomson in 1863. J.R. Strang became a partner in 1866 and the firm operated from its new premises for just under ten years, closing in 1883. From 1885 to 1928 the ground floor of this southern end of the buildings housed Braithwaite’s Book Arcade. Joseph Braithwaite had established his business in Farley’s Arcade in 1863 before the move to Princes Street. 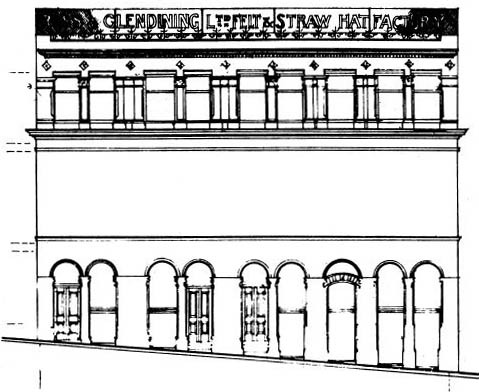 The store had a horseshoe-shaped layout that extended into Reichelt’s Building on the south side, and the horseshoe theme was carried through to distinctive frames over the two entrances. It was claimed over 10,000 people once visited the arcade on a single day, and Braithwaite’s became so well-known that it was considered a tourist attraction. It was a popular place to shelter from bad weather, and everyone from unchaperoned children to the local business elite might be seen browsing the shelves. By 1900 the business employed thirty sales men and women. The footprint of the arcade changed a few times as it moved in and out of neighbouring shops. Detail from c.1907. At the centre is the lamp for Haydon’s Central Hotel. On the left is one of the entrances to Braithwaite’s Book Arcade. The shop on the right was occupied by the jeweller James Bremner. Note the pilasters with their Corinthian capitals. Ref: Collection of Toitu Otago Settlers Museum. The Central Hotel’s license was transferred to John Golder in 1881, and he reportedly installed one of the largest plate glass windows in the colony. He was succeeded by Robert T. Waters, who changed the name to the Baldwin Hotel, perhaps after the celebrated hotel of the same name in San Francisco. After Waters came Charles Nicholson, James D. Hutton, and Thomas Cornish. During Cornish’s time the name changed back to Central Hotel, and later licensees were James Macdonald, E.J. Power, William H. Haydon, and Catherine J. Haydon. The license was lost in 1909, and the establishment afterwards continued as a private hotel and boarding house. It was known as Jackson’s Hotel from about 1922 to 1936, when it became Hotel Central. The hotel featured in an unusual example of pioneering photography, for Dunedin at least. In 1903 a couple were photographed in a bedroom of the City Hotel from an opposite room in the Central Hotel, and the evidence was used in a divorce case. The respondent claimed she was only playing cards with the co-respondent, whom she described as an elderly, very short, stout, bald-headed, and not at all good-looking friend. The jury were unconvinced and a divorce was granted. Tragedy occurred in 1900 when William O’Connell, a 76-year old miner from Nevis, died after falling from one of the rear windows during the night, into the yard below. From 1916 the buildings included the entrance to the Empire Theatre (a cinema), complete with terrazzo flooring and marble mosaics. In 1935 the theatre’s entrance was moved from Princes Street to Moray Place, and two shops were built in the place of the old entry. The history of the shops is complex as over one hundred businesses have operated from them over the years, and partitions were sometimes put up to turn a large shop space into two smaller ones, or taken down to restore a larger space. Most of the businesses that were in the buildings for five years or more are in the list below. The dates are mostly compiled from directories and newspapers advertisements and so are only an approximate. Some businesses moved to different shops within the buildings, including Sucklings (around 1928) and the Ideal (around 1954). The Tip Top is perhaps a surprise inclusion on the list – the ‘no.2 shop’ was here while the more widely remembered ‘no. 1’ operated from the Octagon corner. One of the longest-lasting enterprises in the buildings was the Elite Tea Rooms. Established by Hannah Ginsberg as the Elite Marble Bar in 1915, it advertised a tastefully decorated lounge room, a menu of fifty different iced drinks and ice creams, and a wide range of hot drinks including coffee, Bovril, and Horlick’s. For many years, from 1919 onwards, it was run by Jean Dunford and Sarah Mullin, and the business remained on the site until about 1973. The facades were stripped of their Victorian decoration in 1952 and remodelled to the designs of architect L.W.S. Lowther, incorporating late use of the Art Deco style. The name ‘Hotel Central’ was added in plain sans serif capitalised relief lettering at the parapet level. Directories and advertising suggest that the names ‘Hotel Central’ and ‘Central Hotel’ were sometimes used interchangeably. The private hotel’s last entry in Wise’s directory was in 1977, but it would be could to pin down the date of its closure more accurately. 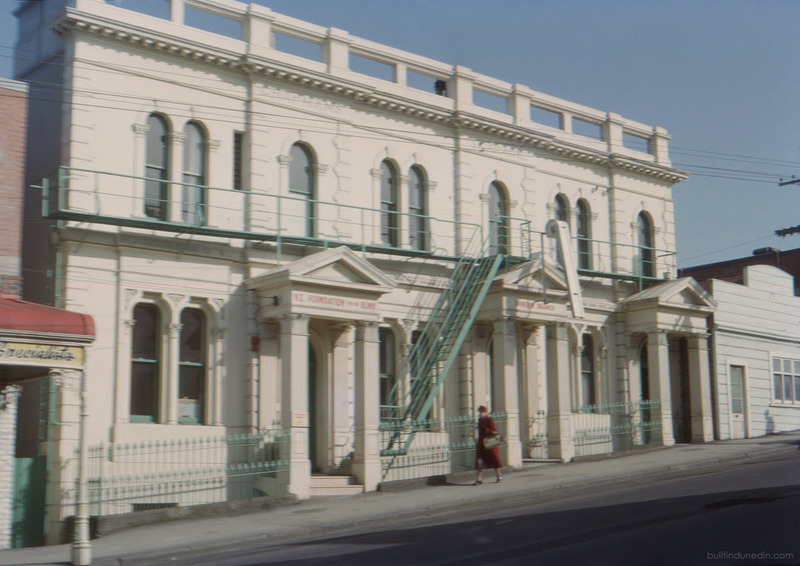 The northern building was demolished in 1987 to make way for additions to the Permanent Building Society building (now Dunedin House). This was remodelled in the postmodern style fashionable in the 80s, and its new features included tinted and mirrored glass, supersized pediments, and shiny columns. The older building now looks cut in half, but the changes made to the facade in the 1950s have exaggerated that effect. It recently changed ownership, so perhaps more change is in store in the not distant future. Otago Daily Times, 1 August 1873 p.1 (call for tenders), 8 August 1873 p.3 (demolition progress), 1 September 1873 p.2 (accident); 22 November 1873 p.3 (progress – ‘out of harmony’); 24 December 1873 p.1(grand opening); 6 June 1874 p.4 (opening of public dining room); 2 September 1874 p.3 (court dispute – contractors), 30 October 1873 p.2 (accident during construction), 3 February 1876 p.3 (Dunning Bros partnership notice), 18 November 1878 p.3 (Dunning’s Central Hotel advertisement), 26 May 1881 p.3 (to let, retirement of Dunning), 9 July 1881 p.2 (largest plate glass windows in the Colony), 21 November 1883 p.3 (winding up of Thomson Strang), 23 April 1900 supp. (Braithwaite’s Book Arcade), 26 September 1900 p.7 (fatal accident), 22 June 1909 p.4 (license refused), 4 March 1916 p.11 (Empire Theatre); Otago Witness, 13 June 1874 p.2, 4 (opening of dining rooms), 2 September 1874 p.3 (dispute); Evening Star, 22 October 1915 p4 (Elite Marble Bar), 16 April 1935 p.2 (theatre entrance replaced with shops). Baré, Robert, City of Dunedin Block Plans. 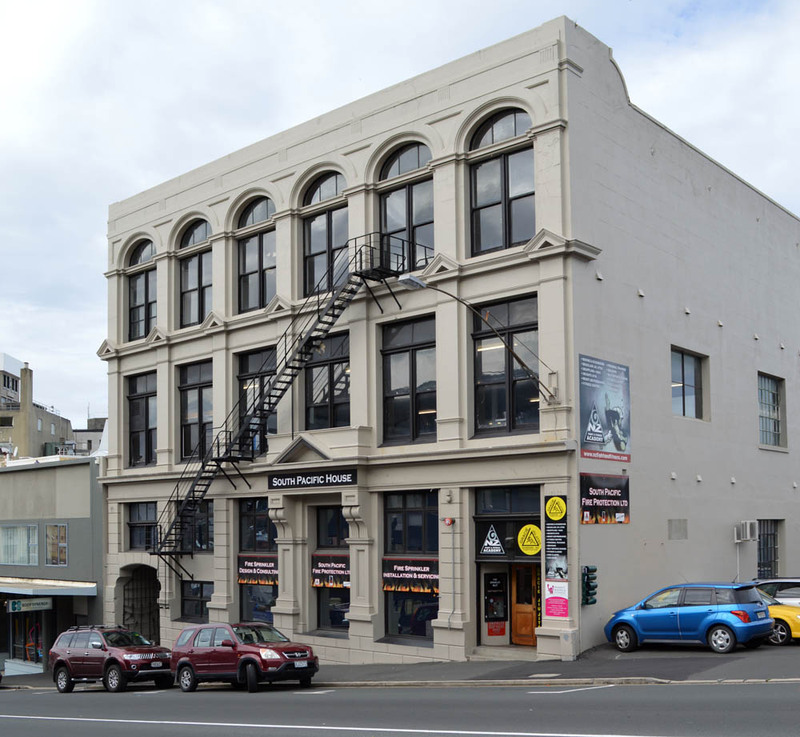 Dunedin: Caxton Steam Printing Company, . W.H. Naylor Ltd: Records (Hocken Collections AG-712/036), plans for 1952 remodelling. This entry was posted in Buildings, Uncategorized and tagged 1870s, 1873, Book shops, Braithwaite, Dunning Bros, Hotels, Jewellers, Mason & Wales, Milk bars, Princes Street, Tea rooms, Theatres, Wood & Steinau on 12 March 2016 by David Murray. Cabinet approved a grant to build a new police station at Port Chalmers in August 1938. This was late in the first term of the first Labour Government, a busy time in the history of public works programmes in New Zealand. It was announced that: ‘the new police station, which will be of modern design, will be situated in George Street near the war memorial. The offices will be on the ground floor, and the top floor will be designed as a dwelling for the sergeant in charge.’ In April 1939 it was reported that the plans had been completed by the Public Works Department, and tenders would soon be called. The estimated cost of the construction was £4,500. The Government Architect at the time was John Thomas Mair (1876-1959), best known in Dunedin today as the designer of the former Chief Post Office. Mair took up the job in 1923 and retired in 1941, so this design came near the end of his career. I do not know what roles he took upon himself for this project, with various other architectural staff in the department also involved. Construction was underway by September 1939, the month war was declared, and in April 1940 the station was described as ‘nearly completed’, together with surprised comment that a foundation stone had not been laid. After some delay the completed building was officially opened by the Minister of Police, P.C. Webb, in a public ceremony on 18 August 1941. The Commissioner of Police, D.J. Cummings, said he had been shocked at the condition of the old station when he visited five and a half years before. In the new building the cells were electrically heated, but he ‘wished it to be understood that they constituted only a “bed-and-breakfast flat,” and there would be no permanent residents’. The architecture combines Moderne with English Domestic influences. It is well harmonised, with exposed brickwork and details that include architecturally-conceived signage, an expertly-sculpted coat of arms, a flagpole, delicate cornice, and curved garden walls. I particularly like the way the metal windows are arranged along the facade, mostly in groups of three, but two in groups of two, and in each case with banded plasterwork between (originally a gold colour as it was elsewhere on the facade). The building also has some of my favourite chimney pots in all Dunedin! The Port Chalmers Police Station remains in use as a patrol base with counter service, and although of course it is operated very differently from the way it was 70 years ago, it still looks very much the same. I am not going to go into a detailed history of local policing for this post, but I can’t end without referring to Sgt Stewart Guthrie, officer in charge on 13 November 1990, the day he was killed by David Gray in the mass shooting at Aramoana. Guthrie was posthumously awarded the George Cross for his courage and heroism that day, and I often think of him when I see this building. Otago Daily Times, 18 August 1938 p.10 (Cabinet approval), 15 April 1939 p.12 (plans completed), 29 September 1939 p.4 (photograph showing progress), 9 April 1940 p.6 (nearly completed), 19 August 1941 pp.5-6 (opening), 23 April 2003 p.6, 24 April 2003 p.4 (proposed cutting of Sergeant’s position), 4 October 2011 p.9 (‘Port police station change proposed’); Evening Star, 19 August 1941 p.2 (opening). 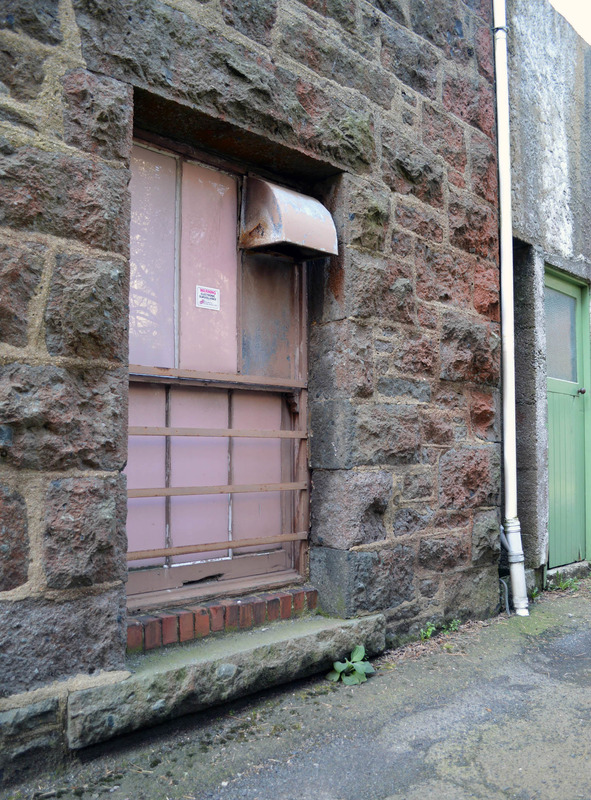 This entry was posted in Buildings and tagged 1930s, 1940s, John T. Mair, Moderne, Police, Port Chalmers, Public Works Department on 29 February 2016 by David Murray. 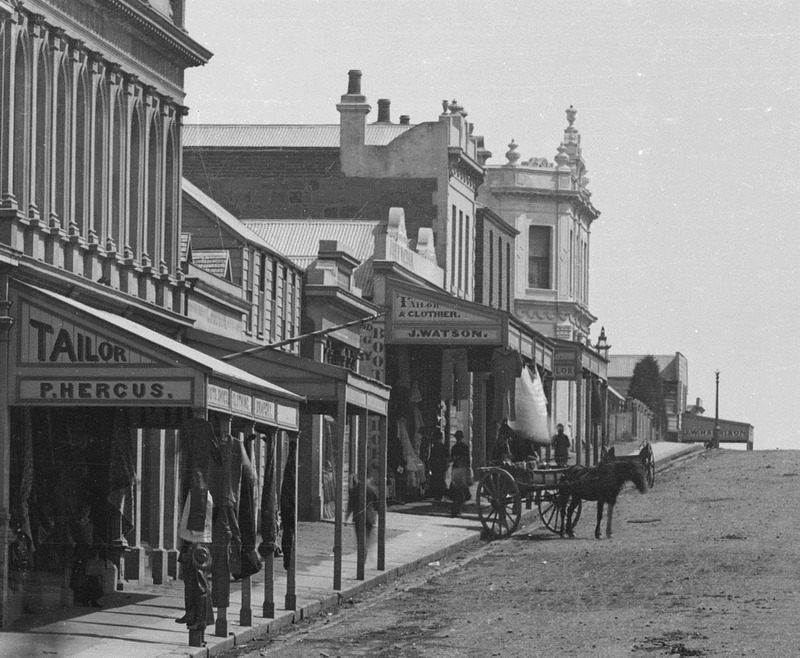 An image from ‘Beautiful Dunedin’ (1906), taken when the building was relatively new. My last post looked at Ross & Glendining’s 1866 warehouse on Stafford Street, and its later redevelopment as a hat factory. I briefly mentioned the adjoining factory buildings facing High Street, and this post expands on that part of the complex. Perhaps another time I’ll look at the company’s large warehouse further down High Street, demolished in 1970. 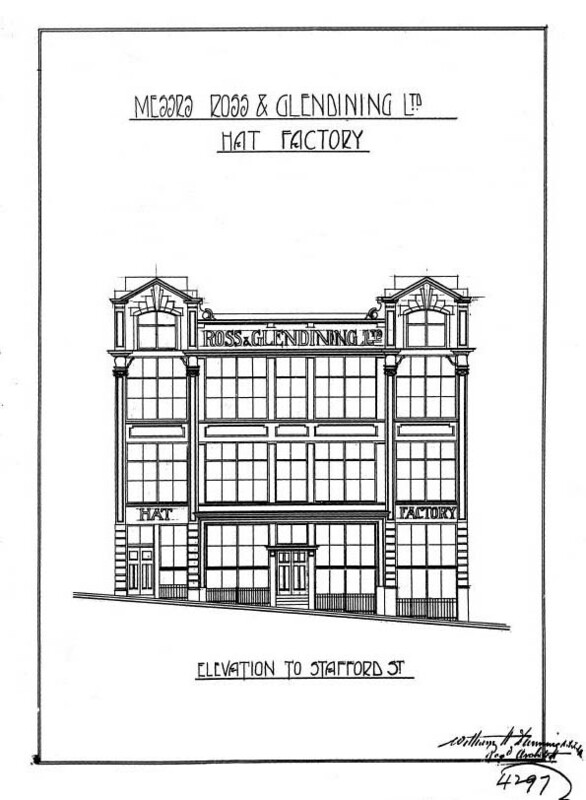 The High Street factory’s origins go back to 1875, when a warehouse and bonded store was built on the site. The building was on two levels, including the bluestone basement. The structure above was brick, with a cemented front. The architect was N.Y.A. Wales of Mason & Wales, and plans still held by the firm show a tramway connecting the building with the Stafford Street warehouse behind. James Hood was the contractor and the building cost £4,274. 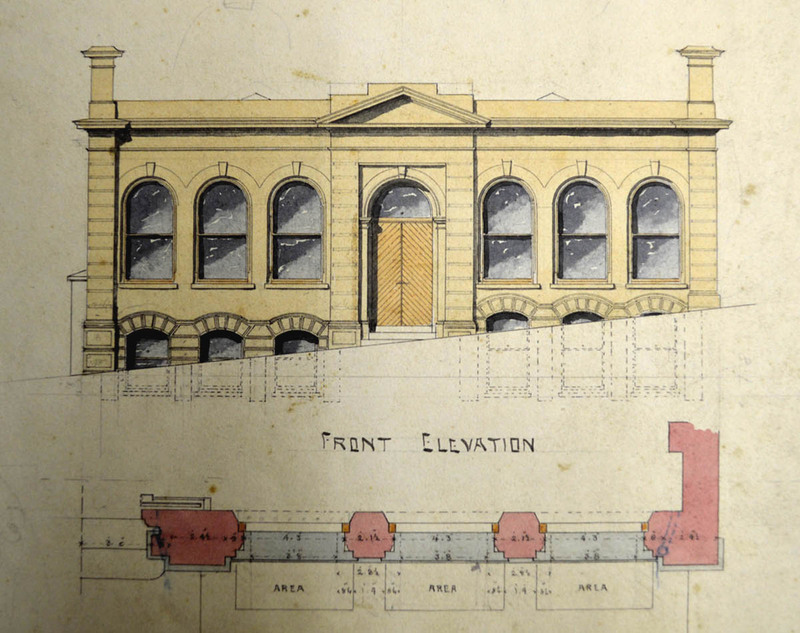 Part of an original drawing for the 1875 building, reproduced courtesy of Mason & Wales Architects. Between 1900 and 1901 two new floors, with extensions over the right-of-way, were made to create a new clothing factory. The designer was Charles Lomax, Ross & Glendining’s Building Inspector, who also supervised the construction work. According to an obituary, Lomax was originally from Blackburn, Lancashire, and as well as building the Roslyn Woollen Mills ‘carried out the erection of every warehouse belonging to the firm in New Zealand, also preparing the plans’. This description was not quite accurate, as others were also involved with building and design work for the company, but it would probably be true to say that no other person had a greater hand in the design and construction of the company’s buildings. The factory operations are at present carried on in the two-storeyed building next the warehouse, but this is found to be inadequate for the trade. The new building will cover an area with a frontage of 66ft and 115ft deep. Including a spacious basement, of a uniform height of 12ft, there will be four storeys, the ground and first floors being 14ft high and the top one 12ft. The basement is to have a limer rock floor, the material for which has been imported from France. This makes a damp-proof floor, which is easier on the feet than one made of wood. It is used for the basement in the present warehouse, and has given every satisfaction. In the basement the engine for driving the machinery used throughout the factory will be located. The floors are to be supported by iron columns and steel joists, the building to be of brick with cement facings and slate roof. On a projection from each floor the lavatories and other conveniences are arranged for. The first floor is divided off into apartments for the office, finishing room, cutting room, pressing room, and dining room. The second and third floors are to be devoted to the operative departments of the factory, the different machines being driven by steam-power. A lift will travel from top to bottom of the building, connecting with all the floors. As was to be expected in a building of this description, ample provision has been made for lighting. There are six large windows to each floor in the front, and an equal number at the back, and these will ensure splendid light throughout the rooms. 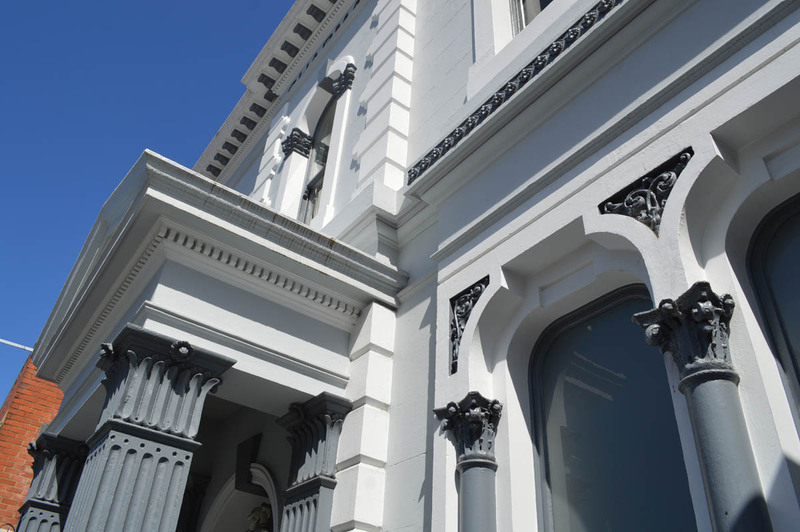 The front has been designed in no particular set style, but it will have an attractive appearance, although not being profusely ornamental, and will be in keeping with the effectiveness of the general run of large buildings in Dunedin. Stephen Jones (whose history of Ross & Glendining I highly recommend) states that a nine horsepower Campbell oil engine replaced the old factory’s three horsepower Otto gas engine. This allowed the number of sewing machines to be increased, ‘there being over sixty Wilson & Wheeler and almost thirty Singer machines of various types installed in the factory by January 1902’. The yard space and outbuildings separating the main Stafford and High Street buildings were eventually redeveloped. 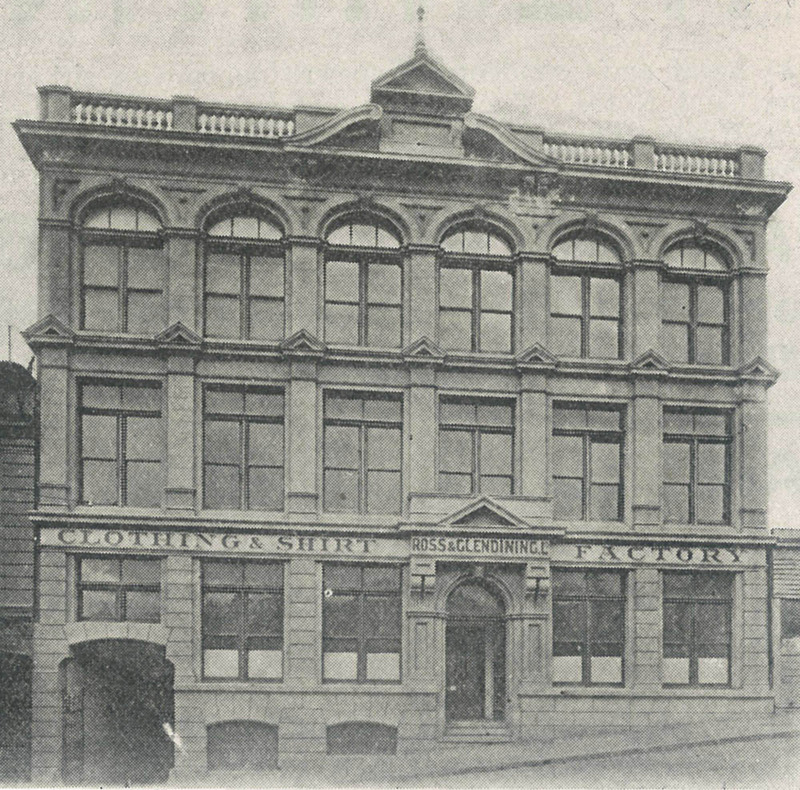 Additions in 1930 housed the company’s boot factory, relocated from Princes Street South, and a further two further storeys were added between 1937 and 1938. The architects for both stages of this work were Miller & White, with Thomas Ferguson the contractor. The first stage of the boot factory additions, designed by Miller & White in 1930. Further floors were added 1937-1938. 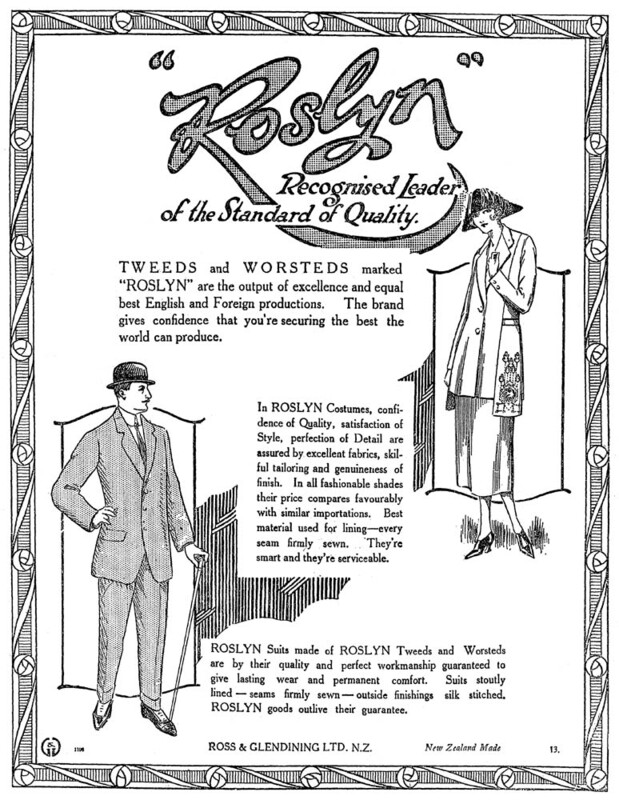 Ross & Glendining was acquired by UEB Industries Ltd in 1966, and subsequently merged into Mosgiel Woollens Ltd, which retained a knitwear division in the building until it went into receivership in 1980. 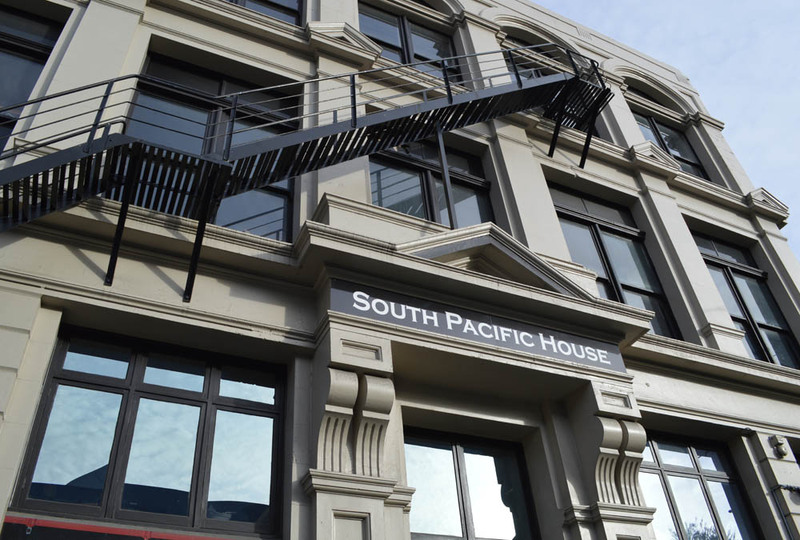 Later occupants included J. McGrath & Co, and in more recent years the building has been known as South Pacific House. Current occupants include NZ Fight & Fitness Academy. The facade remains much as it did in 1901, although looking naked at the top where the balustrade and central pediment were removed in 1937. The fire escape likely dates from the 1940s, and 1941 work included the installation of louvre windows and the relocation of the main door from the centre to the side of the frontage. Sam Lind tells me that you can still identify the location in the basement where the engine running the belts would have been, and there is some evidence of the tramway that ran between the buildings. Some of the ironwork of the overhead shafts survives. 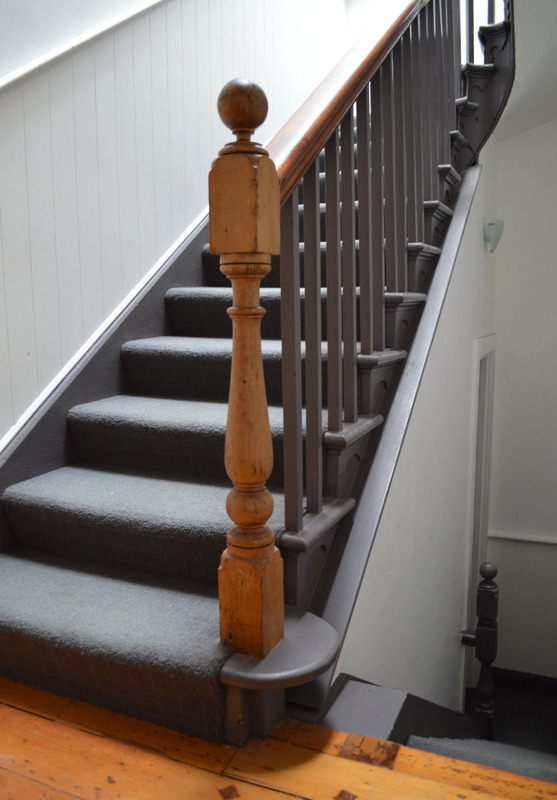 Though most old fittings have been removed, the old stairs, floors, and brickwork all remain appealing interior features. Thanks to Mason & Wales Architects for access to early plans, and to Sam Lind for more recent information about the building. This entry was posted in Buildings and tagged 1870s, 1900s, Charles Lomax, Factories, High Street, James Hood, Mason & Wales, Ross & Glendining, Victorian, Warehouses on 9 December 2015 by David Murray. Terraced houses were rare in Victorian New Zealand despite being common the United Kingdom, where most settlers were born and from where so many building styles were transplanted. Types of terraces there included not only working-class rows of plain design, but also the stylish townhouses of affluent city dwellers. 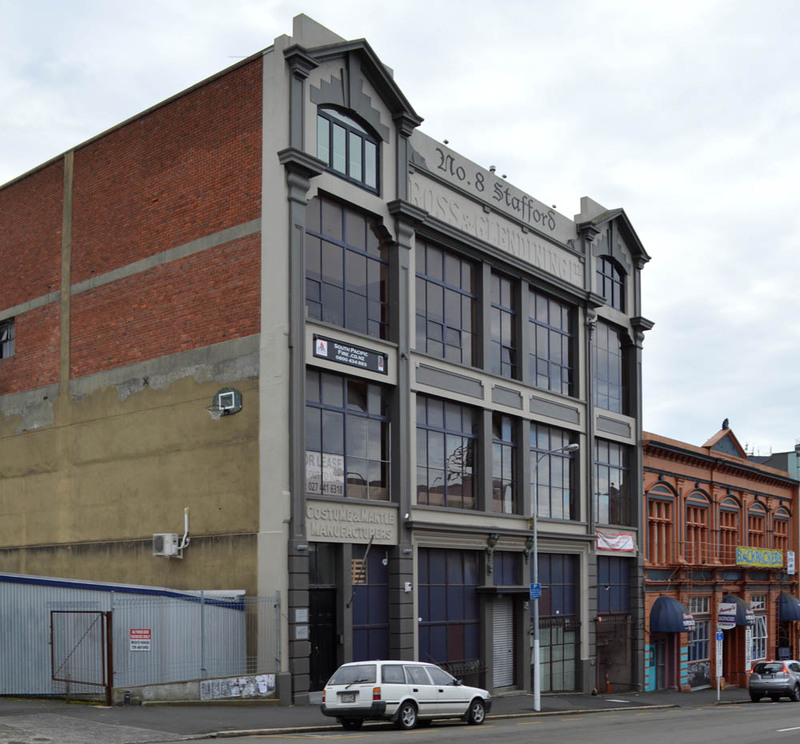 There wasn’t much demand for such buildings in New Zealand, the colony being less urbanised, but of those that could be found many were in Dunedin, the most industrial centre. More than twenty terraces built between 1875 and 1915 survive in the city today. One row in Upper Stuart Street still announces its original name to the world in large letters: Chapman’s Terrace. It was built between 1881 and 1882 as an investment property for Robert Chapman, and remained in family hands until 1910. 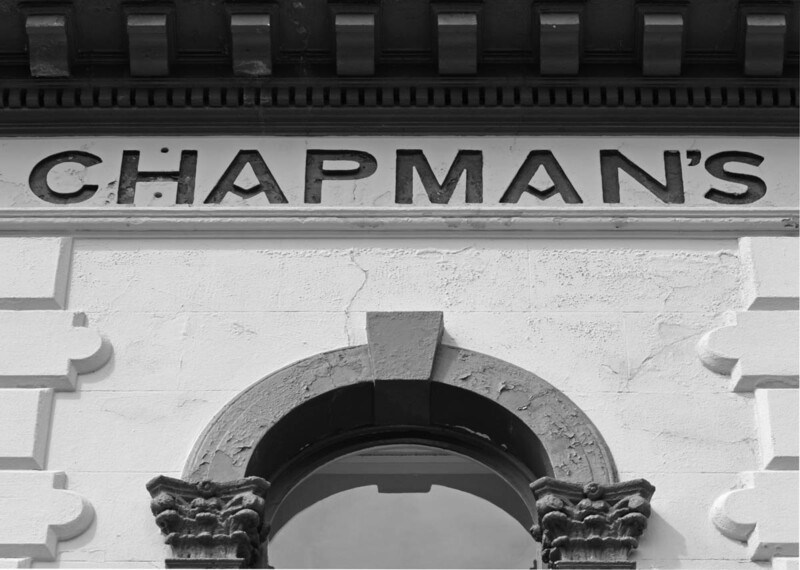 Chapman (1812-1898) was one Dunedin’s earliest colonial settlers. Born at Stonehaven, Aberdeenshire, he worked as a solicitor in Edinburgh before coming to Dunedin with his wife Christina on the Blundell in 1848. 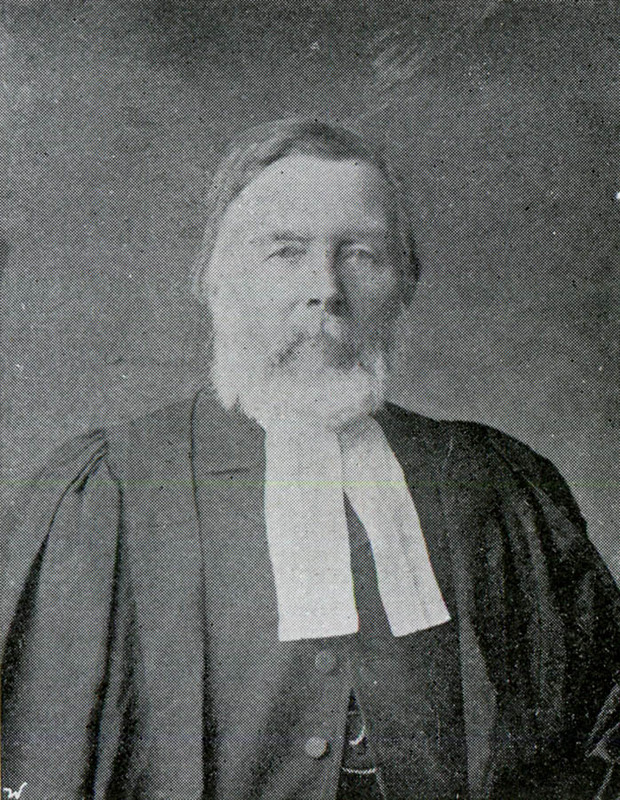 He served as Registrar of the Supreme Court and Clerk to the Provincial Council, but is probably most often recalled as the person who funded a memorial to Rev. Thomas Burns, built in the lower Octagon. Completed in 1892, it stood 19 metres tall and cost over £1,000 to build (as much as two ordinary houses). An immediate source of criticism and humour was that Chapman’s name was carved in the stonework in three places, at least as prominently as Burns’, but from what I can tell the donor was generally a quiet and unassuming sort of fellow and any lapse in modesty was uncharacteristic. 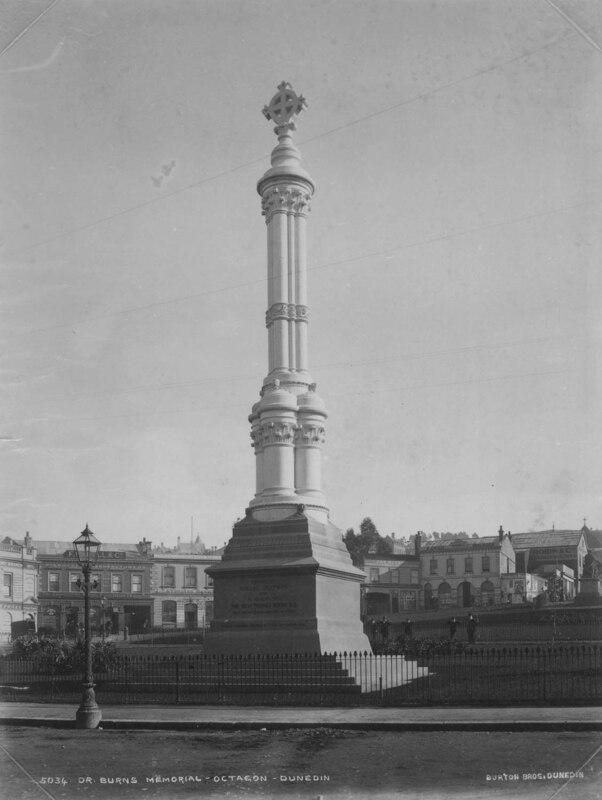 The monument was demolished in 1948. 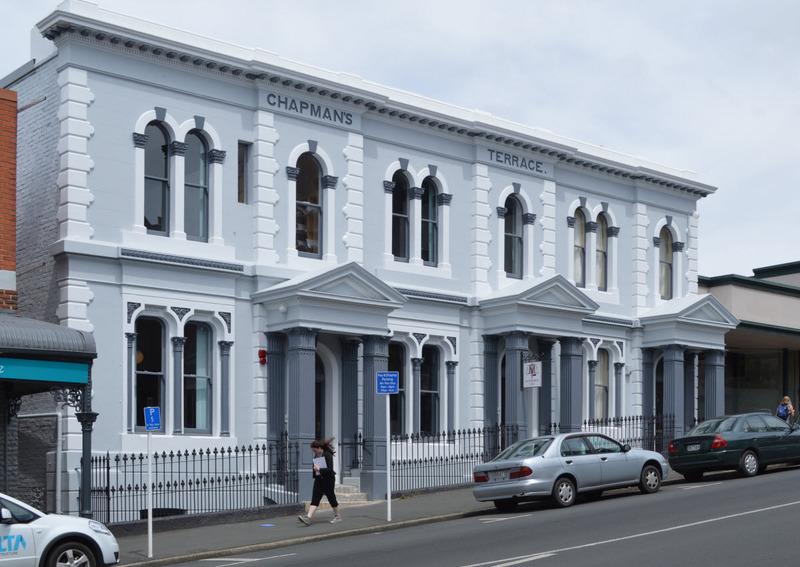 Robert’s son Charles, a lawyer who was Mayor of Dunedin at the time the monument was built, managed the tenancies of Chapman’s Terrace from its earliest years, and likely also had a hand in the building project. The architect was David Ross, who had earlier designed the terrace at 107-111 York Place, completed in 1877. Ross had been engaged by Chapman before, having designed Dunottar House and another villa residence for him. The terrace was built in the Renaissance Revival style, and small but prominent porticos made striking features. The parapet originally had a balustrade, and its loss has affected the balance and proportion of the composition. Pairs of round-headed windows echo other designs by Ross, including Fernhill (John Jones’s residence) and the Warden’s Court at Lawrence. The houses…are of a very superior class, both as regards design and convenience. The block comprises three houses, each of which contains 10 rooms, exclusive of bathroom, storeroom, pantry, &c. Two flats are above the streetline, and two below. All the rooms are fitted up with gasaliers and electric bells of an improved type. The buildings are an ornament to the upper portion of Stuart street, for they are nicely designed, and considerable expense has been devoted to external as well as internal finish. The steep site falls sharply away from the street, and though the building appears only two storeys high from the front, four levels can be seen from behind. The lower ones were built with bluestone walls, the upper ones in brick with cemented fronts. 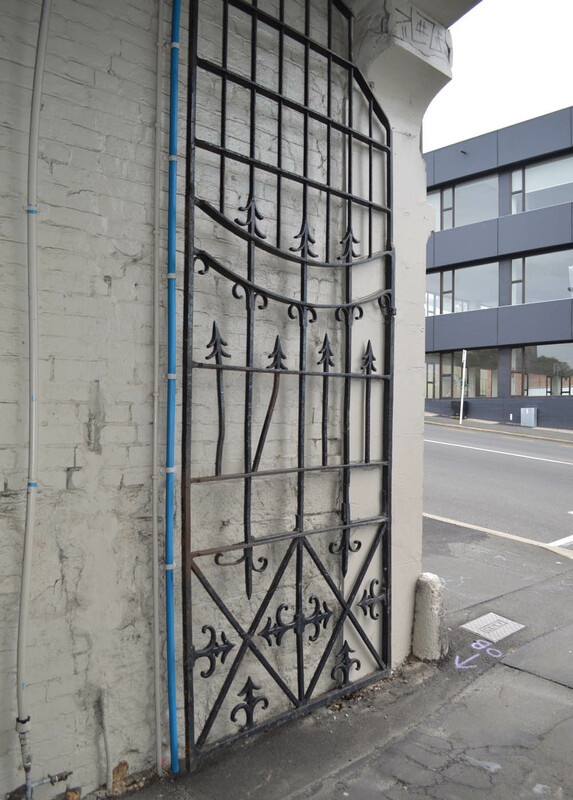 Each street entrance is almost like a little drawbridge, and there is quite a drop behind the iron railings. Magnificent piano (in walnut, trichord, trussed legs, and every modern improvement by Moore, London), walnut suite (in crimson silk rep), large gilt-frame pier-glass, mahogany table and cover, tapestry window curtains, circular fender and fireirons, chess table, whatnot, Brussels carpets, hearthrug, cedar chiffonier, curtains, pole and rings, couch (in hair), dining-room table, cane chairs, sofa, linoleum, cutlery, napery, china, earthenware, B.M. dish covers, double and single iron bedsteads, spring mattress, cheval dressing-glass, 3 chests of drawers, washstands and ware dressing-tables, bedroom carpets, bed linen, blankets, quilts, kitchen table, chairs, sofa, floorcloth, kitchen and cooking utensils, culinary appliances, mangle, hall table and linoleum, door scrapers, mats, etc., etc., etc. For periods each house was run as a boarding house or lodgings, with those who took rooms including labourers, carpenters, clerks, salesmen, music teachers, a share broker, a chemist, a photographer, a journalist, a draper’s assistant, a dressmaker, and many others. From about 1890 to 1902 the upper house was run by Annie Korwin, and around the turn of the century it was known as Stanford House. Those who followed included Eliza and Honor Pye, James McKechnie, Elizabeth Scott, and Margaret and Enid Simmonds. Helen Nantes was the first to occupy the middle house, and from 1885 to 1902 it was the residence of John Macdonald, a medical practitioner and lecturer at the Otago Medical School. Constance Alene Elvine Hall, known as Madame Elvino, occupied it from 1904 to 1910. Originally from Ireland, she variously advertised as a professor of phrenology, world-famed psychometrist, medical clairvoyant, metaphysical healer, business medium, hair colourist, palmist, psychic seer, and scientific character reader. She travelled widely around the country, giving consultations and running popular stalls at carnivals and bazaars. She married John C. Paterson, a sawmill manager, and he joined her in the terrace. Advertisement from the Evening Star, 16 March 1906 p.5 (courtesy of Papers Past, National Library of New Zealand). In 1908 Madame Elvino was charged with fortune telling, an offence under the Crimes Act, but acquitted on the defence of the celebrated barrister Alfred Hanlon, on the grounds that she had only given a ‘character reading’. She was convicted on another occasion in Christchurch in the 1920s. In a New Zealand Truth report titled ‘Face Cream and Psychic Phenomena for Frivolous Flappers’, Elvino was described as a ‘short, dark, plainly-dressed little woman, with a pair of twinkling eyes peering out from behind rimmed spectacles, she looks the last person on earth from whom one would expect any striking occult manifestations’. William and Mary Ann Barry took the house after Madame Elvino, living there from about 1911 to 1932. During that time the First World War affected the residents of Chapman’s Terrace as it did all of Dunedin, and the Barrys’ only son was killed in action in France just a month before the armistice in 1918. Early tenants of the lower house included the prominent music teacher Edward Towsey, and George Bell jr, managing director of the Evening Star newspaper. Those who lived in it for the longest spells were Alice Vivian, Eliza Pye, Mary Hutchinson, Mary Martin, and Robina McMaster. Chapman’s Terrace in the early 1960s. Hardwicke Knight photo. Chapman’s Terrace in the early 1960s. The fire escape dates from around the 1940s. The balustrade railing is still in place but balusters have been removed, giving something of a gap-toothed look. Hardwicke Knight photo. 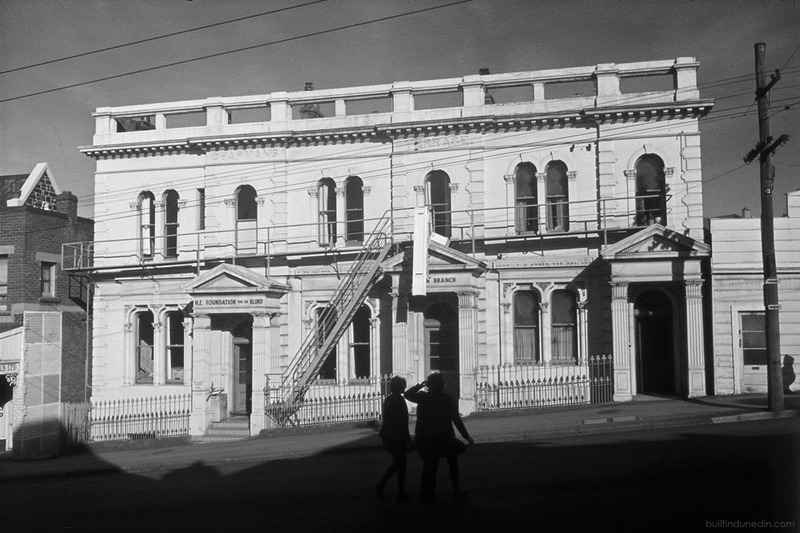 In 1951, then known as ‘Castlereagh’, the lower house at 235 Stuart Street was purchased by the Dunedin Branch of the New Zealand Institute for the Blind. The refurbished rooms were opened in July 1952 and later the institute also acquired the middle house. After extensive alterations in 1960 (including the removal of partitions) the top floor contained a social room, braille room, and cloak rooms, while on the ground floor were a lounge, therapy room, cutting-out room, and the manager’s office. A new stair was less steep than the old one. 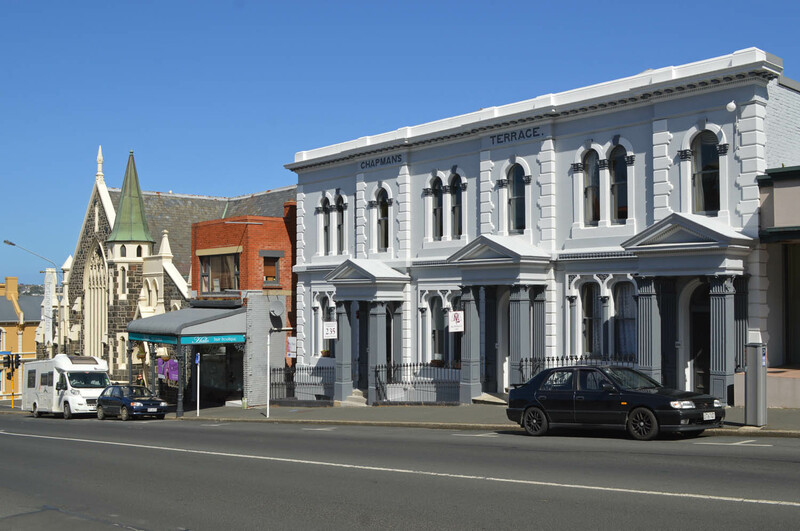 The institute (later Royal New Zealand Foundation for the Blind) remained in the building until new purpose-built premises on the corner of Law Street and Hillside Road opened in 1975. The terrace has been home to a legal practice since 1975, when Sim McElrea O’Donnell Borick & Thomas moved in. McCrimmon Law is now based here and in 2013 one of the building owners, Fiona McCrimmon, oversaw the extensive refurbishment of the terrace. The balustrade was removed in the 1960s, but other original facade features remain happily intact, including pilasters with Corinthian capitals, square columns, quoins, and a dentil cornice. 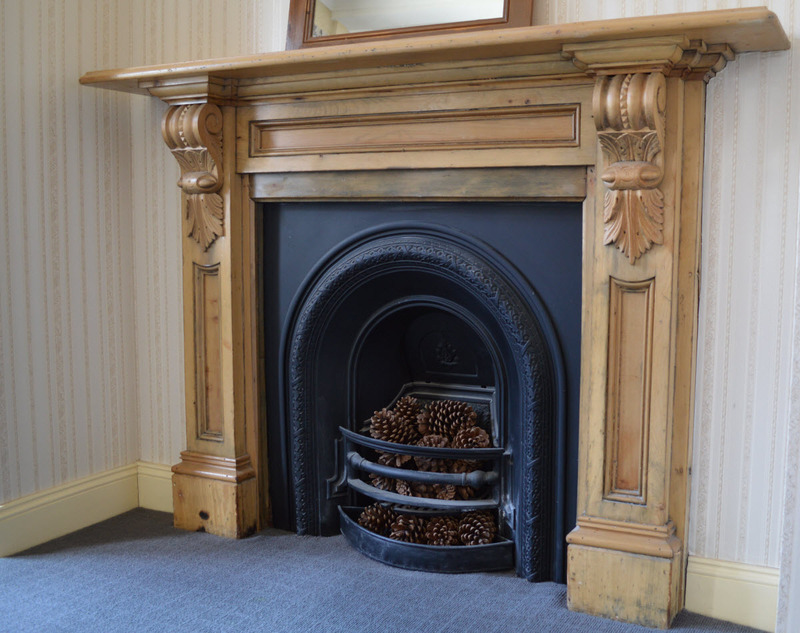 Some internal features that survived twentieth century alterations have also been preserved, including beautiful kauri floors, turned newel posts, ceiling roses and other plasterwork, and a few of the fireplace surrounds. The terrace as it appeared in 2012, immediately prior to renovations. The terrace in 2015. The former Trinity Methodist Church on the corner is now the Fortune Theatre. Rear view, showing the full height of the building, and the stone and brickwork (first painted over many years ago). This entry was posted in Buildings and tagged 1880s, David Ross, Houses, Jesse Millington, Renaissance revival, Robert Chapman, Stuart Street, Terraces on 28 October 2015 by David Murray. 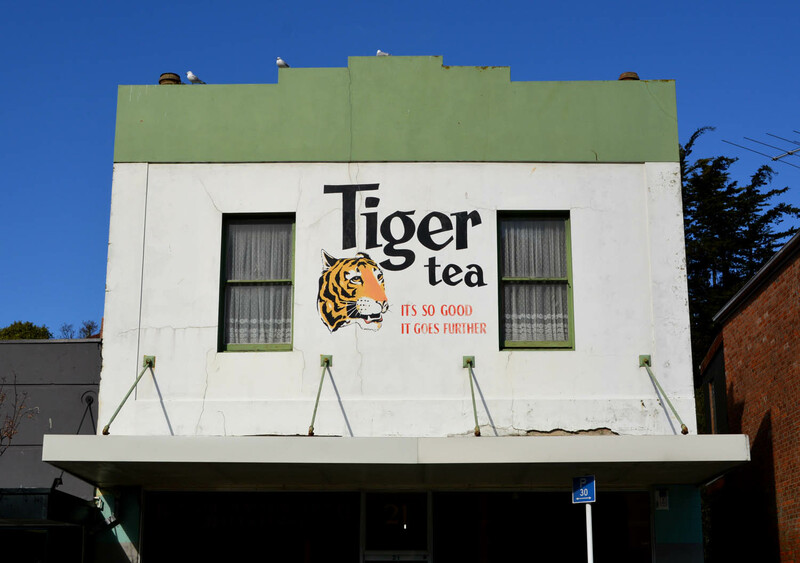 When I’m in Port Chalmers I often admire the distinctive Tiger tea, ‘It’s so good it goes further’, advertising on the front of this building. I’m sure many have a similar fondness for it – Tiger signs were once seen on so many southern dairies and grocery stores, but they’re now relatively scarce. The building was a general store, with a residence above, for 110 years. It was built between 1874 and 1875 as an investment for John Thomson, whose name has come up on this blog before. Thomson (1813-1895) was born at Dewartown, near Dalkeith in Scotland, and after working in coal mining had charge of a sawmill on the estate of the Duke of Buccleugh. He arrived at Port Chalmers in 1848 and worked saw milling and then managing the Government stores, before briefly going to the goldfields. He was afterwards a sheep and cattle inspector, and his Otago Witness obituary stated that he was ‘greatly respected for his sterling manliness of character’. He had established the Dalkeith subdivision in the 1860s, and owned various adjoining properties on the eastern side of George Street. The architect was N.Y.A. Wales of Mason & Wales. The carpenters were Lambeth & Findlay, the stonemasons Kent & Brown, and the plasterer Edwin Philp. The cost was £898. The building was completed in March 1875, but just seven months later was damaged in a fire that destroyed buildings on its north side. The first storekeepers were Sutton Brothers. The business was managed by Edward Sutton to 1891, then by William Sutton to about 1903. 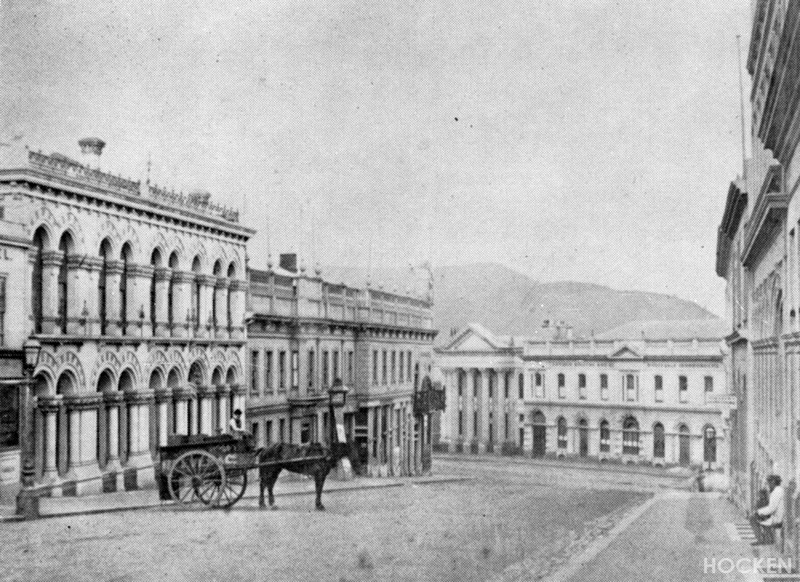 Detail from an 1870s photograph showing the building as it appeared when new. Ref: D.A. De Maus Collection, Alexander Turnbull Library 1/2-003211-G. Detail from another D.A. De Maus photograph, taken in the 1880s. Ref: Alexander Turnbull Library 1/1-002569-G. 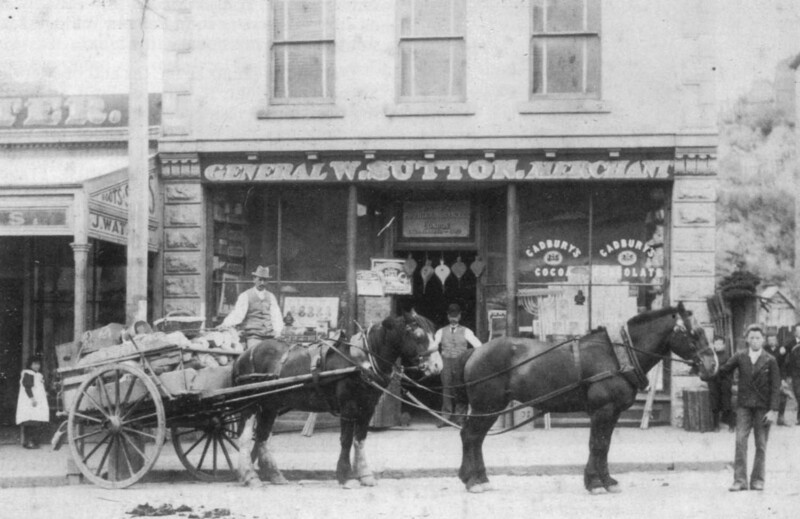 The store as it appeared in the 1890s or early 1900s. Ref: Port Chalmers Museum. D.A. De Maus photographer. The store was run by Jonathan Emerson as Emerson’s Store from about 1903 to 1931, when it became MP Stores. 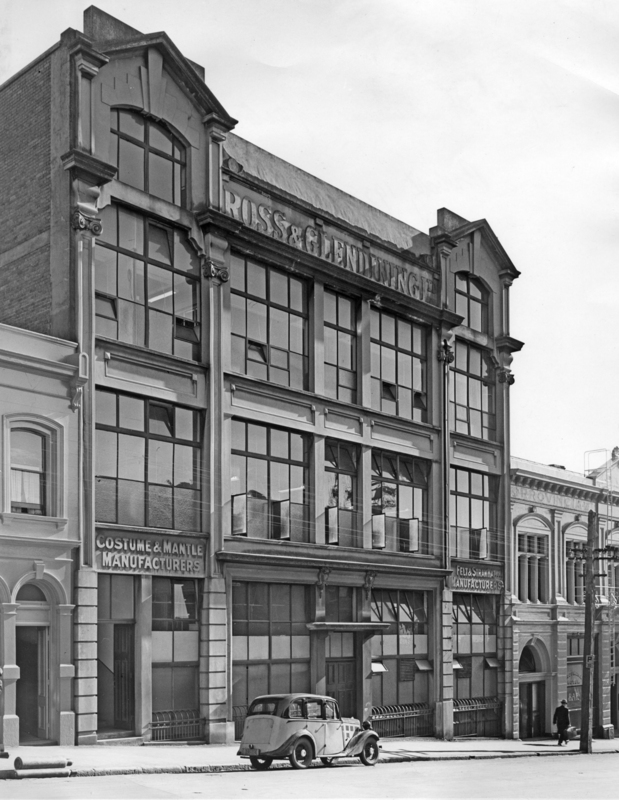 The original MP Stores had been established in Timaru in 1913 as ‘a cash store, with minimum deliveries, in order to enable the proprietors to only charge the public for the goods bought by the individual customer, and not for the bad debts of the non-payer, and also to keep running expenses to a minimum’. MP might have stood for ‘minimum purchase’ but I’m not sure about that, and if there was a direct business link between the Timaru stores and the Port Chalmers one I haven’t discovered it. The name was changed to MP Foodmarket around 1963 and the business continued under that name until it closed around 1985. Since about 1986 Koputai Manufacturing Jewellers have occupied the ground floor. The style of the architecture is Renaissance Revival. Originally, rusticated pilasters topped by corbels flanked the shopfront, with quoins above on the first floor. The composition was topped by a bracketed cornice, and a blind parapet with a modest pediment, small urns, and finials. The principal change to the outward appearance of the building has been the replastering of the facade in the 1950s. 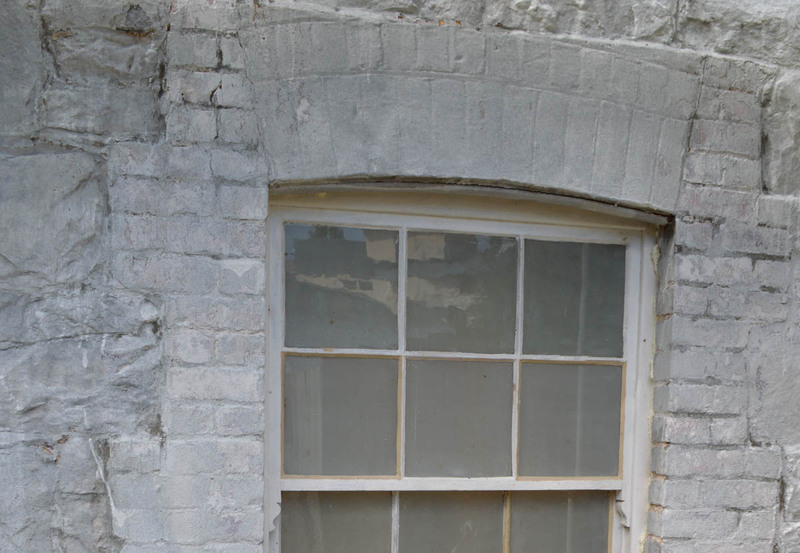 This involved the removal of original mouldings such as the cornice, quoins etc., and the filling in of the centre window on the first floor. 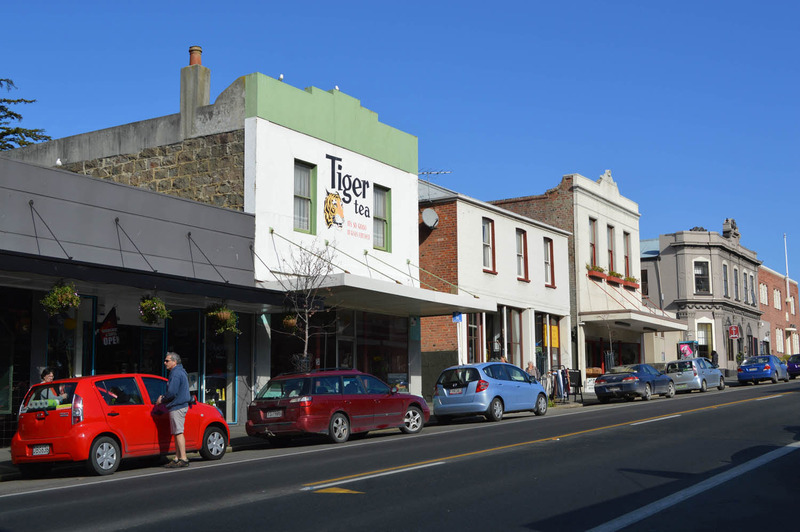 Other changes included the addition of a suspended verandah, and the replacement of the shopfront. The side elevations are in a more original state, and the exposed breccia stonework is a delight – well worth searching out if you’re not familiar with it already. Just look for Mr Tiger. Otago Daily Times, 4 October 1875 p.3 (fire); Timaru Herald 11 August 1913 p.1, 17 July 1920 p.9 (MP Stores). Church, Ian. Some Early People and Ships of Port Chalmers. Dunedin: New Zealand Society of Genealogists, c.1990. pp.784-5. 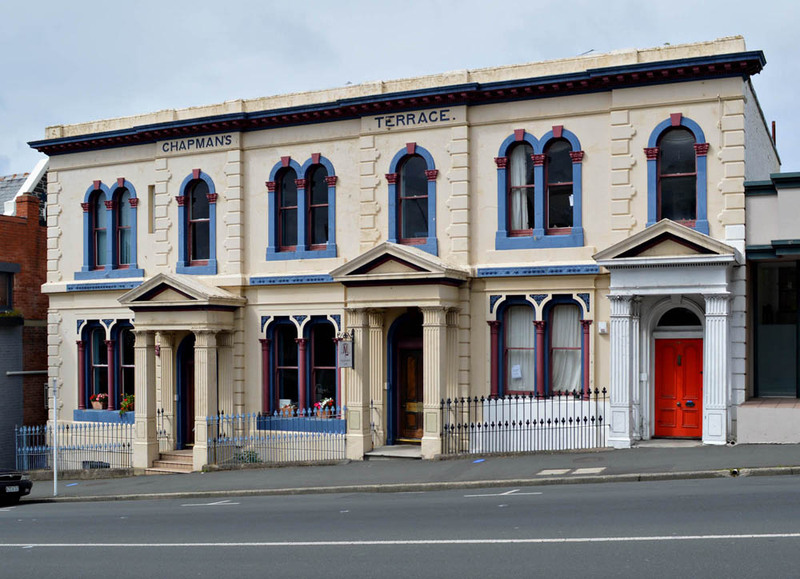 This entry was posted in Buildings and tagged 1870s, Grocers, John Thomson, Kent & Brown, Lambeth & Findlay, MP Stores, Port Chalmers, Renaissance revival, Sutton Bros on 24 August 2015 by David Murray.